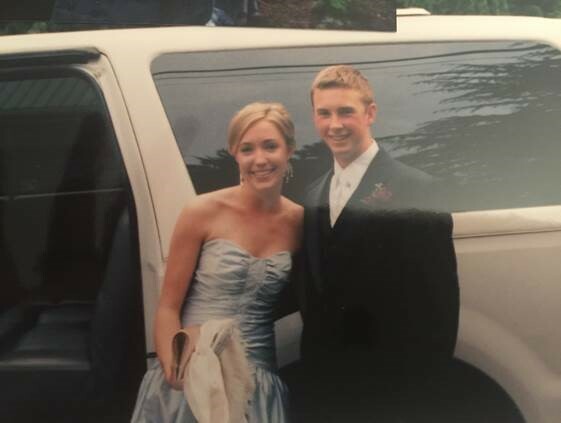 Justin Owens knew he had found the girl of his dreams when he first spotted Lauren Scranton lugging her carryon down the aisle of an Alaska Airlines Boeing 737 on a flight from Palm Springs to Portland 13 years ago. Owens, 15 at the time, had taken out his full CD folder and was getting settled in for the flight, watching everybody board. Everything beyond the moment Scranton (also 15) sat down next to him was all a haze, but Scranton clearly remembers initiating the conversation during the 2.5-hour flight. “(Owens) had a snowboard magazine tucked into the seat; I thought he was kind of cute and I knew we were in for a long flight,” she said. Lauren and Justin at senior prom. When the two broke up right before Scranton moved to California for college, they thought that would be that. But a Facebook query set the stage for them to reconnect years later and the two became engaged to be married in the fall of 2015. Four years ago, Owens posted on Facebook that he was going down to Palm Springs to visit his grandparents and was planning on climbing at Joshua Tree National Park. He asked if anyone had ever been and if anyone had any climbing recommendations. Scranton was the only one to answer. She was living in Los Angeles at the time and asked if she could tag along on the hike. “I was really nervous to send the message; I felt really weird because we hadn’t really talked (over the years),” Scranton said. Owens was nervous too, but he took her up on her offer. After a few hours of climbing together at Joshua Tree turned into 10 hours, it was apparent how right the two were meant for each other. “I remember calling my mom and telling her it was the best day ever; I think she knew then before I knew,” Scranton said. Owens had planned to stay in California for a week, but he kept changing his ticket back home until before he knew it, it had been four weeks. The two dated long distance for the next two years while Scranton finished graduate school at Stanford University. Owens kept track of the number of miles flown that first year of dating: 17,858 miles between Scranton flying to Spokane and Owens flying to Palo Alto and Los Angeles. The two plan to get married this summer on Owens’ family farm in Spokane. Photo courtesy of Michaela Joy Photography. 5 comments on "Love at 35,000 feet: A connection formed on an Alaska Airlines flight forms a lifelong bond"
I had to fly from Spokane to Southern California for business just one month after 9/11. That required a plane change in Seattle & that is where George got on the flight flying standby. He ended up sitting next to me & we talked all the way down to California. He asked me out to dinner the next night. Long , & great, story short……we got married October of 2005 so we will celebrate our 11 year anniversary this fall! I did move from Spokane to Seattle in 2004. We fly Alaska the majority of the time and if not Alaska, it is a partner airline like Qantas when we went to Australia a couple years ago. We have Alaska Airlines to thank for the start of our happily ever after!!! Love it!! My husband and I met the same way! We sat next to each other on an Alaska flight in 2013 SJC-SEA and the rest is history! I wonder how many others have met their partner this way?! Really loved the story. My first thought when they were 15 was oh, no. Thank you for sharing. It is very cool!